There’s something so smoothly soothing about split pea soup. 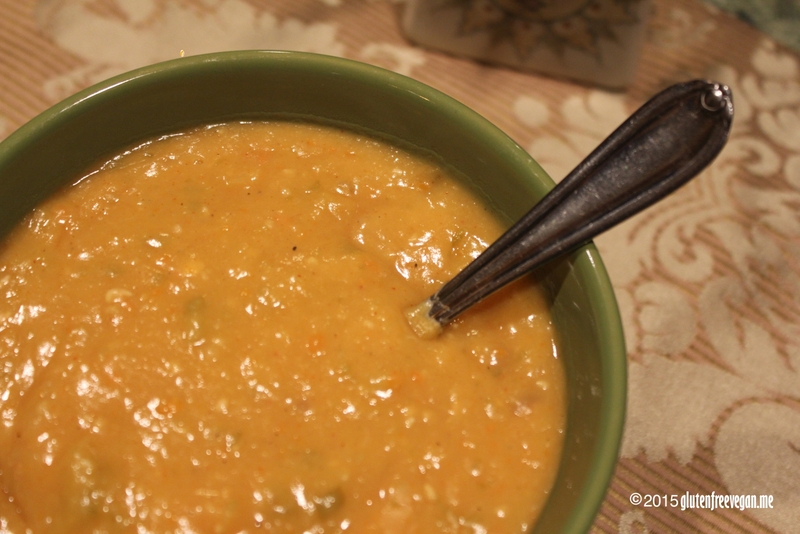 I couldn’t have a soup series without adding split pea. I had never tried making it with yellow peas, and honestly, to me they taste just like split green peas. They happened to be in my cupboard. If you have green ones, they’ll be fine as well. The smoky flavor comes from liquid smoke and smoked paprika so this version is not only delicious, but also cruelty free. The pigs are smiling and after you try it, I hope you will be too. Combine water, lentils and all veggies into pressure cooker or large pan. Bring to boil, cover and simmer for about 20 minutes or follow pressure cooking instructions for making lentils (about 18 minutes). Once cooked, all ingredients will be very soft. Stir with potato masher and add in all spices and liquid smoke. Stir until nearly smooth with a few small pieces of carrots visible. Top each bowl or cup with coconut or tempeh bacon if desired. Serve as a meal or starter. This entry was posted in Recipes, soups, Vegan Information and tagged comfort food, gluten-free, glutenfreevegan.me, glutenfreeveganme.com, healthy, soup, split pea, vegan cooking, vegan recipes, veggies, winter. Bookmark the permalink.